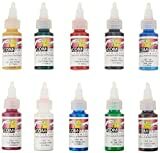 Kit B by Com-Art Paint includes ten 1-ounce bottles of Opaque Secondary airbrush colors. Com-Art professional paints are versatile and feature a unique common hydro-carbon base binder which means they can be used together without bleeding between colors. 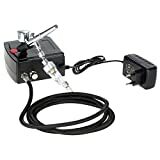 Ready to use this non-toxic paint is formulated for use with an airbrush and never need to be strained. Colors are heavily pigmented, lightfast and dry instantly. Opaque colors are White, Black Phthalo Blue, Phthalo Green, Iron Yellow, Carmine, Magenta, Burnt Umber, Cerulean Blue Hue and Sap Green. Precio actualizado hace 5 horas y hace 38 minutos.